Figure 4.1 An early revelation of the magnitude of paleobotanical change across the K-T boundary (from Dorf 1940). Reprinted by permission. Problem'' and the inability to resolve angiosperm leaf taxa would diminish the utility of Cretaceous and Paleogene paleobotany until the late 1970s. In 1922, paleobotanist F. H. Knowlton published a description of the megafossil flora of the Laramie Formation of the Denver Basin, Colorado. He had delayed publication for a number of years because of the confusion over the Laramie Problem and he included in his paleobotanical treatise an extensive and detailed review of the problem up until that time. 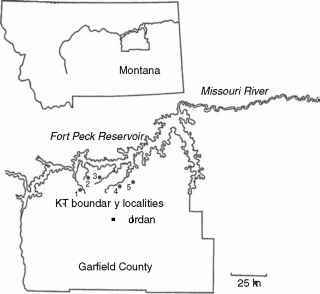 In retrospect, the Laramie Problem can be thought of as a dispute between paleobotanists and vertebrate paleontologists about the correct stratigraphic position of the K-T boundary in western North America. Final resolution came from the careful analysis of both the stratigraphy and the megafossil floras by Dorf (1940, 1942a, 1942b) in the type area of the Lance Formation (uppermost Cretaceous) in the Powder River Basin, and by Brown (1943) in the Denver Basin. Dorf (1940) recognized a clear pattern of megaflora extinction across the K-T boundary but his analysis was at the formation level and he never clearly delineated an extinction event based on direct superposition of floras. Nonetheless, his 1940 diagram graphically shows for the first time the magnitude of the K-T megaflora extinction (Figure 4.1). This work was long ignored. Lingering problems in paleobotanical taxonomy were not clarified until still later with the advent of additional fossil leaf studies.